Washington (CNN) - President Barack Obama struck an urgent tone in his weekly address Saturday, telling members of Congress that he needs a debt ceiling deal on his desk before next week's deadline. "Congress must find common ground on a plan that can get support from both parties in the House," Obama said. "And it’s got to be a plan that I can sign by Tuesday." Obama's remarks come one day after the House voted along party lines to pass a Republican-sponsored debt plan. The bill was tabled without a vote in the Democratically-controlled Senate. In his address, Obama said that that such maneuvers weren't helpful in staving off a debt crisis. "Republicans in the House of Representatives just spent precious days trying to pass a plan that a majority of Republicans and Democrats in the Senate had already said they wouldn’t vote for," Obama said. "It’s a plan that wouldn’t solve our fiscal problems, but would force us to relive this crisis in just a few short months. It would hold our economy captive to Washington politics once again. If anything, the past few weeks have demonstrated that’s unacceptable." In his appeal for a bipartisan debt plan, Obama included a list of potential consequences of a credit rating downgrade, telling Republicans who oppose tax increases that they, too, would be affected. "Make no mistake – for those who reflexively oppose tax increases on anyone, a lower credit rating would be a tax increase on everyone - we’d pay higher interest rates on mortgages, car loans and credit cards," Obama said. 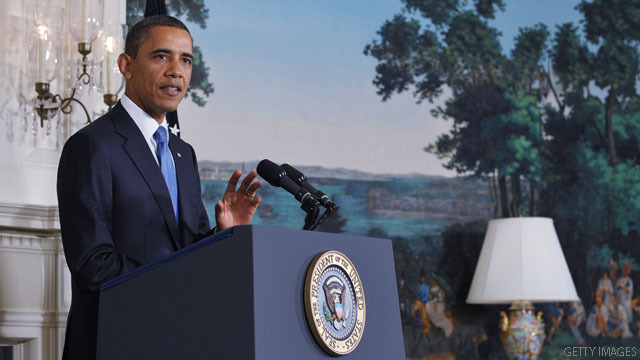 Obama stressed that the two parties were close in theory to striking a deal, with much common ground and only small differences that need to be worked out. "Look, the parties are not that far apart here," Obama said. "We’re in rough agreement on how much spending we need to cut to reduce our deficit. We agree on a process to tackle tax reform and entitlement reform. There are plenty of ways out of this mess. But there is very little time." joe walsh, gotpeer extraordinaire, and one of the biggest mouths in congress against the president and raising the debt cailing OWES $117,000 on back payments of child support. Family values be dam ned. I know about money and how to run my personal life. Have kids then don't pay for them. These are the kind of people some of you voted for in 2010 to cleanse the gene pool in congress. Unfortunately all you people did was to bring in more pond scum!!! It simple why this is still going on, it seems the house speaker wants to see this same circus during an election year, and he takes his orders from Rush, and the Billionaire Brothers. What maneuvers? Tabling a bill in the Senate without even giving it a vote, after it already passed the House? The T-Party is backed by Koch, ALEC and other Global Corporations that are only interested in profits.. They are lying to and fooling many Americans with the fake rip off of Libertarian Values! ALEC has been writing laws for GOP for a long time but after Obama's election and GOP loosing all 3 legs of Washington power, The Group of Global Corporations started thier own Party within the GOP. the T-Party. To Finish what Bush and his GOP started! America with no perks for living, breathing, Ageing, Human Beings and everything to Global Corporations that syphon America's Wealth to offshore Banks! More class warfare sponsored by a inept, incomptent, corrupt union toady. This is the Kenyan village idiot whose only real job is hanging posters on telephone poles for SEIU/ACORN. You notice how although he calls for bipartisanship, he only singles out the Republicans. I guess because the Republicans actually pay their taxes unlike the dope addicts, welfare frauds and corrupt union bosses that steal taxpayer money to give it to democrat liberals. With old stoopid Harry blocking every bill from discussion and forcing it to the table, how will a compromise ever be worked out. THe arrogance of the Senate leader is astounding. The GOP keeps trying; the Dems keep shooting them down, mostly because the Dems know that without the ability to go on buying votes with other peoples' money, the Democratic Party is more or less toast. The President is correct! But, I am afraid; the party of “NO, HELL NO” is not listening! But, the voter should! These games, that do not shy away from throwing economies and financial markets in America and worldwide to the ground, have to stop! Of cause, the depth has to be worked on and the spending too – but do not be fooled into believing that the GOP/TP is going to be the ones to do it! They talk, talk, and talk about simplistic solutions for very complicated problems, with talking points that have not worked then and will not work now – nothing new. That they do with only one goal in mind: to allure the American voter and forward their agenda against the President and regain power and greed. They have proven that they have NO interest to work for all Americans – just for “VERY SPECIAL” interests. Where's YOUR PLAN???? You could have had an agreement weeks ago but then decided it was more important to demand more tax increases to please your far left base. You say you want to "tackle tax reform and entitlement reform" but that translates to tax increases on the minority already footing the tax bill and a giant NEW government entitlement program called Obamacare (with $500 Billion taken from Medicare to fund it). I don't know why anybody would believe a single word that comes out of this snakes mouth. Over and over and over, he says one thing but does the exact opposite. The blatant dishonesty is becoming clear to even some of his more ardent supporters.